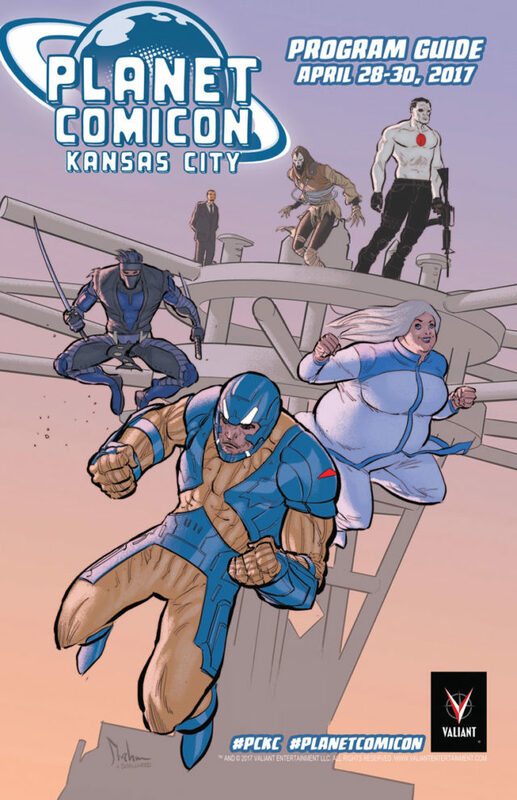 From Friday, April 28th through Sunday, April 30th, Valiant’s cross-country convention road show is planting its flag at Kansas City, MO for Planet Comicon – and we’re bringing along a non-stop line-up of merchandise, programming, and panels to celebrate! All weekend long, join Valiant inside Kansas City’s Bartle Hall at booth #1523 to find out why readers everywhere have declared Valiant as their favorite superhero universe with a selection of paperbacks and deluxe hardcovers for critically acclaimed and award-winning titles including BLOODSHOT REBORN, BRITANNIA, FAITH, HARBINGERRENEGADE, NINJAK, QUANTUM & WOODY, SAVAGE and many more! And don’t forget to grab your copy of the official Planet Comicon 2017 Event Guide, featuring an explosive cover by acclaimed artists Kyle Strahm (Spread) and Greg Smallwood (Moon Knight) uniting the Valiant Universe’s biggest icons! Then: Get to know one of the most celebrated superhero universes in comics today on Saturday, April 29th at 3:30 p.m. CT in room 2104 for the VALIANT 101: THE STORY STARTS HERE panel presentation! New to the Valiant Universe? Jump on board right here with a concise and fun-filled introduction to the origins and adventures of Valiant’s greatest and most iconic heroes – from BLOODSHOT and DIVINITY to FAITH and HARBINGER RENEGADE to NINJAK and X-O MANOWAR! From The A.V. Club to Buzzfeed and Entertainment Weekly and dozens more, Valiant has been hailed as the premier superhero publisher in comics today… Now, look no further than this panel of Valiant all-stars to find out where to start! We’ll see you in Kansas City! 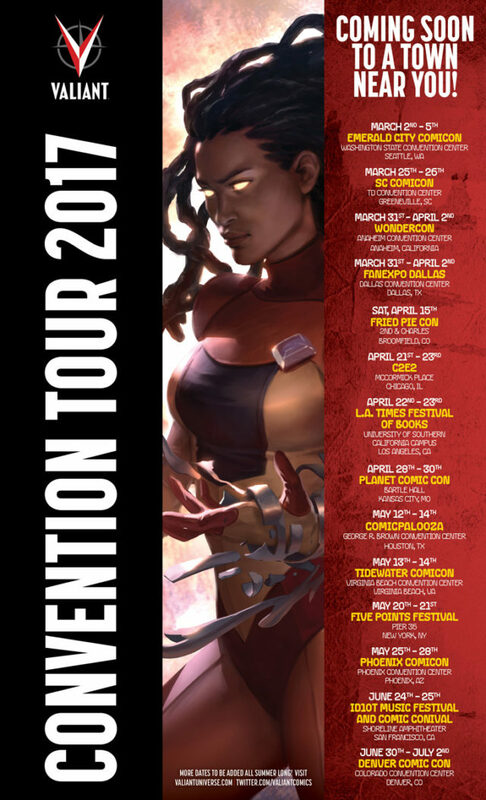 And don’t skip a second of the action as Valiant’s one-of-a-kind convention road show marches on through Houston; New York; Colorado; and more throughout the spring!